Grill chicken until internal temperature reaches 165 f. Once done, allow meat to rest on a plate for 10 minutes. Once rested, chop into small cubes. Add cubes to a bowl, and then add in 1/2 cup of ranch and chopped celery stalks. Mix until combined. 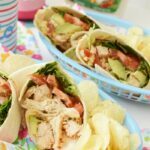 Line wraps with greens, tomato, avocado, and cheese. Add in a spoonful of chicken salad and enjoy!